sFlow-RT™ incorporates InMon's asynchronous analytics technology (U.S. Patents 8838774, 9509583, 9712443, 9722926), delivering real-time visibility to Software Defined Networking (SDN), DevOps and Orchestration stacks and enabling new classes of performance aware application such as load balancing, DDoS protection, and workload placement. Network visibility is essential to understanding the interaction between scale-out services running on cloud infrastructure. 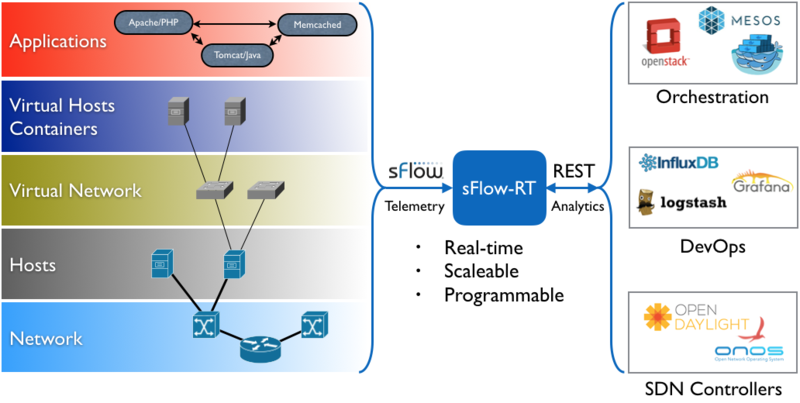 By combining network, host and application monitoring within an integrated analytics pipeline, sFlow-RT provides visibility into applications and the server and network resources needed to sustain performance. Visit sFlow-RT.com to download sFlow-RT software and applications. Please post questions, suggestions and applications to the sFlow-RT group. Contact sales@inmon.com to discuss commercial licensing options for sFlow-RT.